From September 23 to October 5 Batumi will be hosting the 43rd World Chess Olympiad. 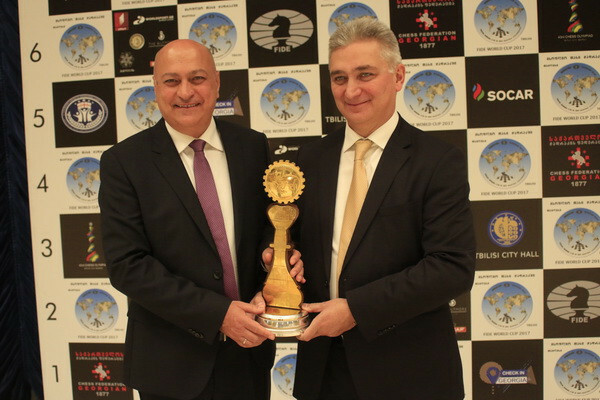 Batumi won the right to host this large-scale international tournament in 2014 at the General Assembly of the World Chess Federation (FIDE) held in Tromso, Norway, where it got 93 votes and the opponent Durban got 58. The 4-year work of the Organizing Committee of the Olympiad is about to end. The heads of the Organizing Committee – the President of the European Chess Union, a member of the government commission that assists the Olympiad, Zurab Azmaiparashvili and the President of the Georgian Chess Federation, the Chairman of the Organizing Committee of the Olympiad, Giorgi Giorgadze will talk about the subjects related to the Chess Olympiad and the Continental and FIDE elections, which will be held during the Olympiad days. The 43rd World Chess Olympiad will be starting in less than a month. In mid-September, Georgia will be visited by up to 4 thousand guests from 189 different countries. Batumi will be hosting such large-scale sports event for the very first time, the expectations are far too great. Our country has to pass an international exam. Are you satisfied with the preparations for the Olympiad? Giorgi Giorgadze: The Organizing committee of the tournament, which has about 100 employees, has already moved to the 24-hour working shift - we are at the last stage. I can assure you that there is really nothing to be nervous about, everything is going according to the plan. By the way, recently the volunteers were selected. Approximately 300 motivated young people will help us in the days of the Olympiad, they are ready to present Batumi and Georgia in the best possible way. FIDE leaders were most worried about the halls. The Deputy President of the organization Georgios Makropoulos even said so in an interview with us during his visit to Tbilisi. Has the construction of the halls and the amenities been completed? Giorgi Giorgadze: There really was a problem in this regard, but I can say with pride that we were able to do an impossible job, build a 2700 sq.m space in 6 months. Now the last stage is under way: the space connecting to the halls is being prepared, and the whole construction is decorated with the logo and sketches of the Olympiad. In the next few days, cleaning of the playing halls will start, then the Georgian Chess Federation and the Olympiad’s Organizing Committee will sign the necessary documents and the halls will be temporarily handed over to us. Continental presidential elections of FIDE will be held in Batumi. Mr. Zurab, you are the only candidate for the presidency of the European Chess Union. Tell us if something has changed in your election campaign after our last interview and what's new in this direction? Zurab Azmaiparashvili: No changes have happened, we are still working accordingly to the plan. I am sure that the presidential elections for the European Chess Union will be held in a calm situation, because of the ECU statute, which is very well constructed and excludes confusion. Giorgi Giorgadze: I know that however the presidential elections of ECU ends, Zurab Azmaiparashvili will be president for the next 4 years and we are very proud of it! Because of the events developed around the FIDE President Kirsan Ilyumzhinov, FIDE's presidential election is the biggest interest. Candidates Georgios Makropoulos, Arkady Dvorkovich and Nigel Short have already started their election campaigns, which is going interestingly. Therefore, it is clear that on October 3, on the election day, Batumi will be the center of universal attention. Does this mean that the Olympiad’s Organizing Committee is planning to take additional measures of security? Giorgi Giorgadze: Chess is a game for intellectuals and I doubt that the presidential candidates will arrive at the election with weapons… But all jokes aside, we will definitely take security measures. Our proper Government structures will help us, this is their direct prerogative. Zurab Amzaiparashvili: The elections are always accompanied by tension, but I do not remember any such forums where there was such complication. I hope that Batumi won’t be an exception. For us as the organizers of the Olympiad, not only the presidential candidates, but all the guests of the Olympiad and Congress are very dear and we will definitely show Georgian hospitality. FIDE has formed a special committee to conduct presidential elections fairly and transparently. Do you think that FIDE's decision has affected the presidential candidates' election campaigns in any way? What is your, the heads of the Organizing Committee’s, main message for all the participants of the elections, for the candidates and the delegates as well? Giorgi Giorgadze: I will address tall the FIDE presidential candidates with the slogan of one of the Georgian Chess Federation’s most successful projects: play chess! That's my message... So, with full responsibility, I declare that the organizing committee will create equal conditions for all the candidates and delegates. I hope that after the Batumi elections, developing chess in the world will have a new stimulation. Zurab Azmaiparashvili: I agree with the message of the Georgian Chess Federation. I will also add that all the candidates participating in the FIDE presidential elections should be certain that they will be hosted at the highest level in Batumi. As the Olympiad’s organizers, we will try our best to make each of them feel like they’re in their own homely environment, but after the elections, we will all be sitting at the Georgian table where all of us will taste the best wines from “Winery Khareba”. The composition of almost all countries’ participating teams in the Olympiad has been announced, but the members of Georgian Open and Women’s teams have not yet been announced. When will the composition be announced? How are the candidates of the national team preparing? Giorgi Giorgadze: The Georgian Open and Women’s teams are already known and they are intensely preparing to show as great result as possible. I would like to also tell you that our country, as the host of the Olympiad, has the right to participate with several teams and we will definitely benefit from this right ... It is a great honor to play at the Olympiad and I wish all members of our team to succeed!